Rolled up. Protected. Sweet inside. Will it crack and break apart? 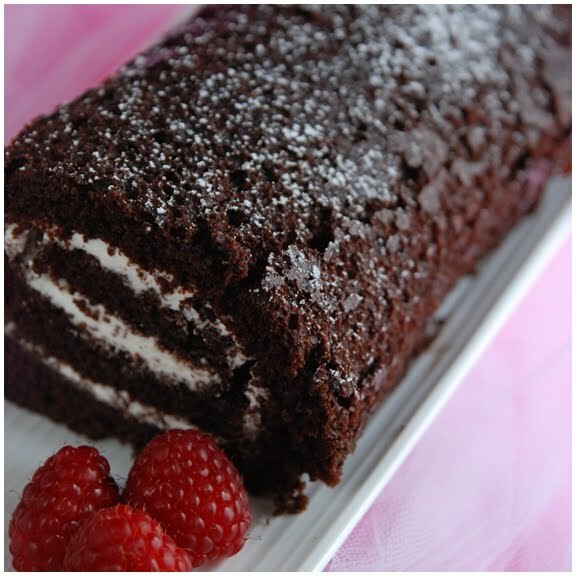 The word Roulade (roo-LAHD) originates from the French word "rouler" meaning "to roll”. On the savoury side, roulade can be a thin slice of meat rolled around a filling of bread crumbs, mushrooms, and cheese, or a mixture of vegetables and cheese or even sushi. On the sweet side, roulade refers to a soufflé type mixture that is spread on a jelly roll pan, baked until firm but still moist, and then spread with a sweet filling, rolled up while warm in jelly roll fashion, and served in circular slices. 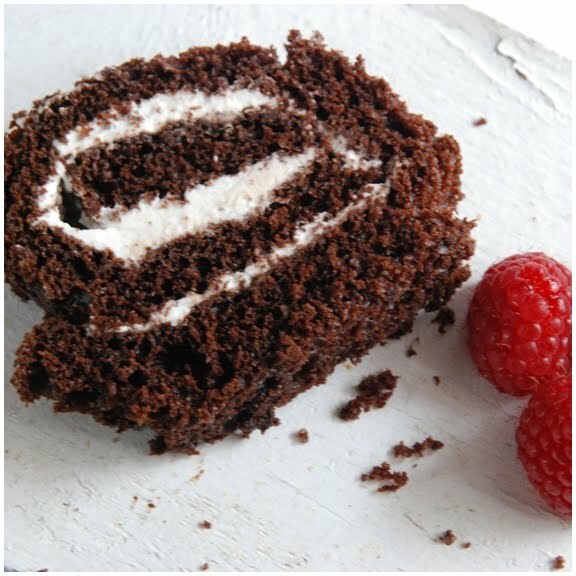 This type of cake is sometimes called a jelly roll or a “Swiss” roll although it is thought to have originated in Central Europe and not Switzerland. 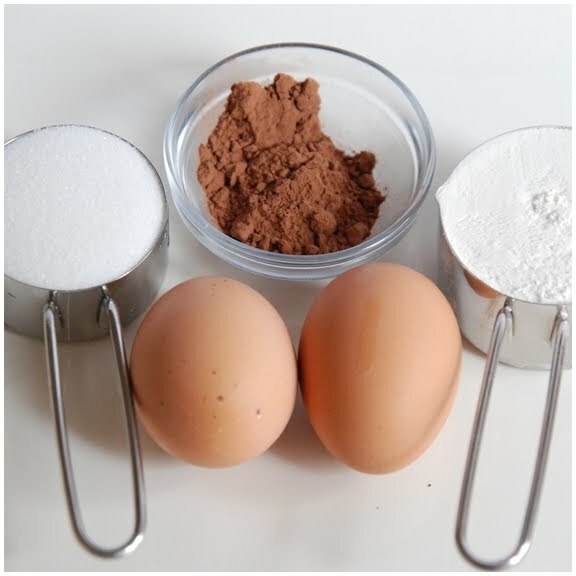 The recipe I started with contained four ingredients. 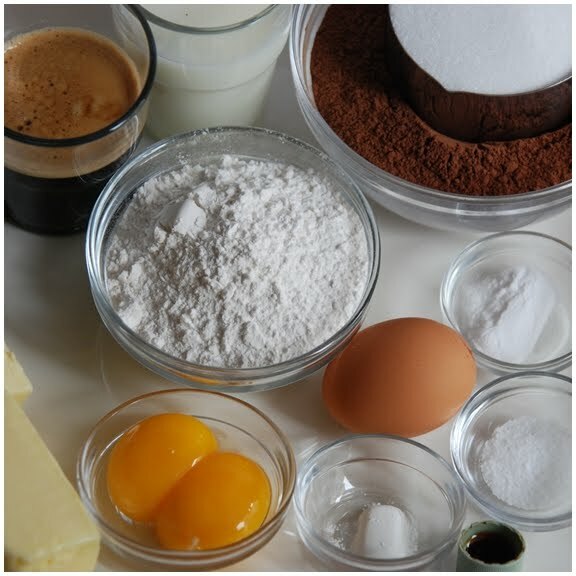 I've noticed that the recipes with fewer ingredients can be tricky. Take, for example, pâté à choux, mayonnaise or sabayon! Cookie roulade. That's what my attempt at the Chocolate Roulade from Le Cordon Bleu Complete Cook Home Collection looked like. Unrollable. I may need to get expert assistance from a pastry chef for that recipe. Instead, I turned to a food blogger and chef I admire: Shuna Lydon from Eggbeater. She wrote about her Devil's Food Cake recipe back in 2007 at Bay Area Bites so I thought I'd give it a try as a roulade. Stand still, yet we will make him run"
Preheat oven to 350˚F. Place oven rack in middle of oven. Butter and flour 9" round cake pan or individual ramekins or jelly roll pan for roulade. If you have parchment paper, cut out a circle and place on bottom of buttered pan. Butter and flour over parchment, if using. Pour cracked egg and yolks into well and whisk briefly. Pour in coffee-melted butter mixture, whisk briefly. Then pour in buttermilk and whisk thoroughly to incorporate the mixtures. Attempt to eliminate any lumps. Add a splash of pure vanilla extract. Batter will be very loose, pourable. Pour batter into prepared baking vessel(s) and set on a baking pan. (This insures heat will be better distributed than if you just put the cake pan directly on the rack of the oven.) Set first timer for 20 minutes. At the 20 minute mark, turn pan around, and set timer for another 10-15 minutes. (If you choose not to turn pan around it will most probably rise lopsided.) Cake is done when skewer or sharp knife inserted in middle comes out clean and/or when sides pull away from pan and middle bounces back to the touch. Cool cake pan on cooling rack until room temperature. Turn cake out to cool. Roll with whipped cream. You can find the recipe for Chocolate Roulade in the Le Cordon Bleu Complete Cook Home Collection (page 413). This Devil's Food Cake on its own without the cream filling tasted slightly bitter and unpleasant. But with the sweetened cream it was perfect. I'm cooking my way through a cooking school curriculum (currently Basic Pastry) using Le Cordon Bleu at Home cookbook. The "classes" are based on the curriculum from Le Cordon Bleu found online and used as a guideline. Not all the items in the curriculum are in the cookbook, but most are. Where the items are not in the book, I try to find a suitable substitution. Find out more here. Check out the winner of the Giveaway—Le Creuset 7 Piece Spatula Set! Molto buono questo rotolo, mi piace il cioccolato per cui una sola fetta non mi basterebbe,ottimo risultato! Interesting that the cake wasn't good on its own, but the combination was perfect. So was the poetry (this does sound like strength and sweetness all rolled into one!) It's so pretty too. Looks scrumptious! I love rolls but have always been too afraid to try them for fear of making cookies like you mentioned. Perhaps I'll give this one a go. Your roulade looks fantastic! Good to know the cake really needs the sweetness of the filling. Sounds delicious. looks wonderful! That filling, mmmmmmm! I'm surprised that the devil's food cake came out bitter and unpleasant. It's the kind of cake I usually eat out of hand even without frosting. What cocoa did you use? Maybe it was alkalized and wasn't meant to be with the baking soda? This cake looks fantastic and you really capture the texture in your lead photo. I am new to your site and have really enjoyed reading your posts for the past month or so. I look forward to your inspired recipes and lovely photos. I'm surprised that the cake didn't taste good alone. But when I really think about it when I have had devils food before I to thought it wasn't that good, but I love regular chocolate cake by itself. Anyway, it looks good! I've always been intimidated of a roulade. Going to try this one out! !